“A right is not a special privilege of the fortunate but it is ingrained in the soul of every institution and in the dignity and worth of every person”. 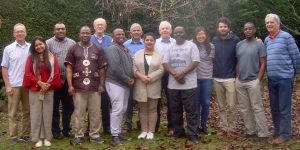 This is an insight I gained through the two weeks long training program conducted in Geneva by the Edmund Rice International. It was a great opportunity for me to learn new things and broaden my perspective as I interacted with participants from different countries and cultural backgrounds. In the process of the training program, I learned about the different organs of the UN in detail. The visits to the UN for attending the UPR session and the Treaty Body Session helped me to understand the situation of countries under review from a multi dimensional perspective. We also visited the Irish mission which gave me a realisation about the amount of hard work that goes in the making of a national report of a country under review. The resource persons who conducted various sessions were expert in their own area and were people who were working in their own field with a compassionate heart. I personally particularly enjoyed the sessions taken by Enka from Franciscans International and Nora from the UN High Commission for Refugees (UNHCR). The joyful sessions conducted on SDG’s and Climate Change left a very powerful impact on my heart and I realised that if we don’t change, our future generations will have to pay the price for our mistakes.